Snippets of Jack: "This is Politics"
After reviewing the "Code" The "Brethren Court" found that they needed to elect a new King. Now everyone wanted the power to make decisions about the upcoming stand against the British Navy. Some wanted to blockade themselves in the stronghold of Shipwreck Cove, some wanted to do the piratey thing and run, and still others actually wanted to fight. But only one gets to make that decision, The King. Every Pirate Lord in the room voted for themselves of course; Except one. 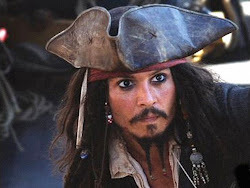 Captain Jack Sparrow voted for the rookie Pirate Lord Captain Elizabeth Swann. The crowed went into an uproar and started killing their fellow Lords. Elizabeth Swann"This is madness! "Jack Sparrow "This is politics." Their newly elected King (with the help of Jack) put an end to the pointless fighting soon after it began. Jack explained their plan to the Court, "We must fight…to run away." And dear Elizabeth immeditaly started giving orders "Prepare every vessel that floats. At dawn, we're at war. "―Elizabeth Swann. But Barbossa had another plan. After his crew members collected the "Nine pieces of Eight" the took them away. A few days later they came out once again, and Barbossa put his plan into action. He didn't believe that the Court could win the battle against the Fleet of Navy vessels, so he helped them by releasing the bounds put on the goddess Calypso (Who controls the sea) This act changed the tide of the battle, and help the Court quite a bit. But the end came when Jack committed another act of bravery. But you know all about that don't you?